The in-house bending facilities enable us to construct U-tube bundle at the most competitive cost and fastest delivery. ‘U’ bundle is constructed in accordance with ASME VIII DIV I and API 660 requirements. ‘U’ tube bending is specified in accordance with TEMA ‘R’. Flattening of the ‘U’ bend portion should not exceed 10% of tube diameter. Tube wall thinning should not be less than minus 17% of the tube wall thickness. Leg length (total overall length) -0 + 5mm. 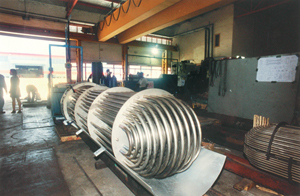 Stress relieve can be arranged with reputable heat treatment company.